Welcome, and thanks for stopping by! Please look around, and contact us if you have any questions, or are interested in the availability of any of our work. Thanks! We were honored to jury into and exhibit at Artisphere 2018 in Greenville, SC. We exhibited at one of the nation's top juried art festivals, Cherry Creek Arts Festival in Denver, CO, July 1-3, 2017. We were also been juried into the exclusive Opening Gala and Artist's Preview Event on the evening of June 30. We were honored to jury into and exhibit at Artisphere 2017 in Greenville, SC. We are honored to have received the Haynsworth Sinkler Boyd Mayor's Choice Award at the Artisphere, Arts, Culture, Life festival in Greenville in May 2015! 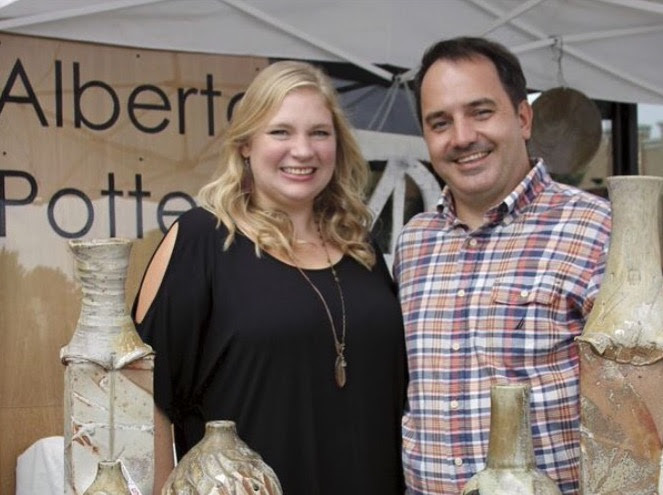 Alberta Pottery is the home studio of ceramic artists Erin and Jason Hall. Full-time ceramic artists, we specialize in handmade, one-of-a-kind, functional studio pottery and sculptural ceramics. We are located on Alberta Avenue in Greenville, SC. We have a small showroom that is open by appointment, although, unfortunately, we are unable to open our studio to the public at this time. We travel with our work to national juried festivals, are represented by several galleries locally, and show our work on a weekly basis at our pop-up shop at Garner's Natural Life in Greenville. We work primarily in stoneware and fire in a high temperature gas reduction kiln. Our work is collected internationally. We work in stoneware and use both wheel-throwing and hand building techniques in our studio. Each piece is created with utmost attention to detail and craftsmanship. We create to the best of our abilities, and want each piece to be a reflection of this value, and of our unique creative vision. We use a locally-sourced stoneware claybody, which contains three different types of grog (pulverized fired clay) that gives it its color and texture. Our claybody, made up of many types of clays and other materials giving various desired properties, also contains a small amount of iron. This gives our glazes a speckled look because of the iron burning through the glaze. 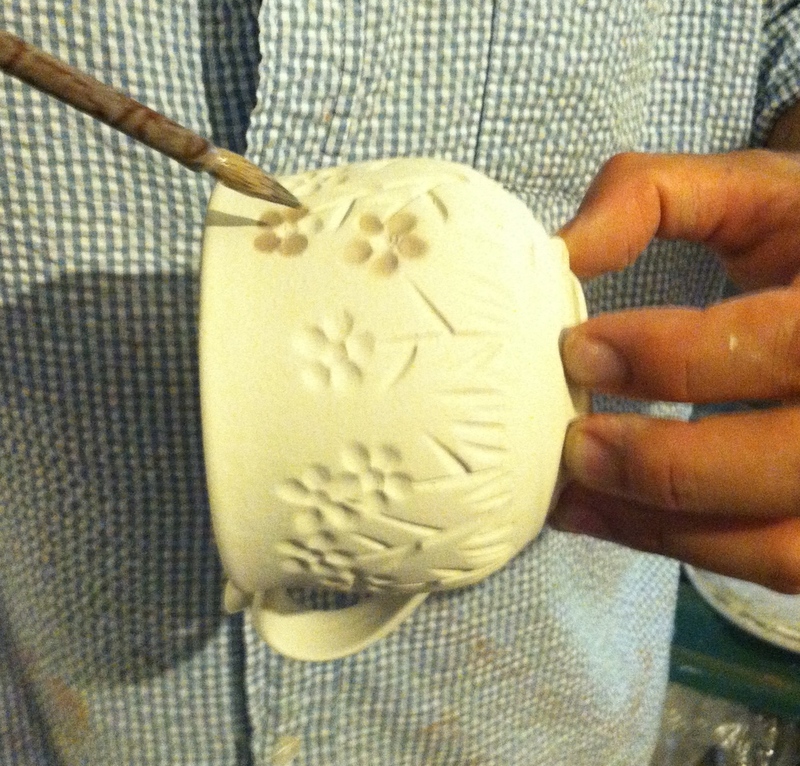 Once complete to the greenware stage, the work is bisque-fired in an electric kiln and glazed. We mix our own glazes from dry ingredients using traditional recipes, such as Shinos and Celadons, that we have adjusted to our claybody and firing process. The large gas reduction kiln in which we glaze fire holds about 200 pieces at a time, as is fired for 8-15 hours to 2,375 degrees F to full vitrification. Our functional work is non-toxic, food, microwave and dishwasher safe, though hand-washing is recommended. Each handmade ceramic piece begins on the wheel, and is then altered, carved or faceted when leather-hard, glazed and often dusted with wood ash, then fired in a high temperature gas reduction kiln. While similar in process, each piece is unique in form and surface. The work is process-oriented and ever-evolving, reflecting the vastness of possibility with clay. Creating forms which capture the softness of wet clay, but which also speak of volume and contained space, the hand and the mark of the tool, are all essential parts of the work. Another important aspect is surface; the character of the glazes, especially in combination with wood ash, and their behavior over different textured surfaces, are all continually informative to the process and resulting forms. They evoke the natural world, particularly landscapes and sky over which fluid dynamics have shaped sand or cloud, in much the same way glaze and ash become molten liquid and melt over form in the presence of flame. The pieces, while fully functional, are also intended as sculptural forms for consideration. We came to clay separately through our academic training. Jason’s background is in structural steel engineering, which he learned in his family’s business. However, from an early age, he was always making objects with his hands, and his family encouraged him in this direction. He began making handmade pots and sculpture during his high school years at the Fine Arts Center in Greenville, a specialized school for art students. He also attended the SC Governor’s School for the Arts summer program. He then continued his studies at Clemson University where he studied architecture, engineering and fine art, graduating with his BFA degree with a concentration in ceramics in 2001. In addition to pottery, Jason is also an accomplished painter and sculptor. Erin grew up in a very creative family of artists, writers and educators, and was encouraged to pursue her passion for the arts. There's a story that Erin told her mom she wanted a potter's wheel when she was about 3, however she did not get one until much later! Through her high school years, she studied theatre, also at the Fine Arts Center and SC Governor’s School for the Arts, and she attended Stetson University in Florida for her undergraduate work. It was at Stetson that she took her first ceramics class, and ended up double-majoring in theatre and art, graduating with BA degrees in each. She attended Clemson University for her MFA, where she concentrated on sculptural and installation-oriented ceramics, graduating in 2003. We met in the clay studio at Clemson, with studios next to each other, but didn't really get to know each other there (Jason was living on a 57-foot-houseboat, and Erin thought he was trouble)! We went our separate ways after graduation and both worked in clay semi-professionally for about 10 years each, while also working other jobs. During that time, (possibly by divine intervention), we ended up in studios next to each other again, in Greenville's Village Arts District. We maintained a cooperative studio, Gallery 1279, for about 5 years. Married in 2012, we moved our studio home, and continued working in clay, while Erin taught ceramics and art history at a local university, and Jason worked part-time in his family's engineering business. When the pottery sales became more profitable than our other jobs combined, we decided to take the joyful leap to become full-time ceramic artists and start Alberta Pottery, LLC in the summer of 2014. We absolutely love what we do, and we feel so thankful that we are able to do it everyday! We hope our work is a reflection and communication of this love.